Andi Korte & co. are back with a new album. I can't believe it! I know these band from Berlin for years and I was more then happy when they released in 1998 their debut album Fireproof. On Fireproof they finally made killer tracks like Jackyl & Hyde and Jack The Ripper available on disc. Now, 3 years later they are back with a new label. First I recognized the powerful production and the band is sticking to their roots. But wait! Somehow Sokaris isn't what I expected. 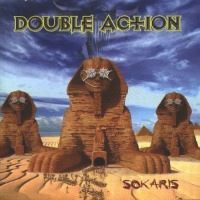 After the excellent opener Sokaris the first disappointment with Hard Days which is a boring, badly structured songs with an awful refrain. A change between good and bad songs follows and Hot Stuff is the worst! Also the track Burning Nights is a filler on the second album of Double Action. Why? The rough version on Fireproof is much better then this polished one and I think it ain't necessary to push up the running time with that kind of action. The rest of the material isn't that bad, so fans of European power metal should give it a try. On songs like Revelation, Rats and Another Life Double Action show their best. Unfortunately Sokaris couldn't keep the level and the freshness of Fireproof.